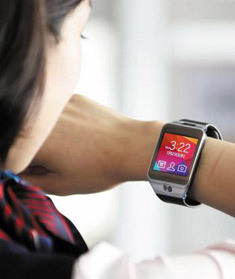 Samsung is to unveil a smartwatch with communication function dubbed the Gear Solo. Its existing wearable smart devices like the Galaxy Gear do not have their own communication functions and must be attached to a smartphone to make calls or exchange e-mails or text messages. Facing intensifying competition from low-priced smartphones and feature phones in China and India, Samsung's strategy is to gain a solid technological lead with the Gear Solo. Apple and LG also plan to roll out new premium smart devices in September. Samsung hopes the gadget will help it stay ahead of Chinese rivals that are catching up quickly armed with low-priced smartphones. The Gear Solo will have its own phone number and offer all kinds of communication functions. In the sporting niche market where smartwatches have some appeal, runners can now leave their smartphone at home and still make or receive calls. The Gear Solo is Samsung's answer to complaints from sports and leisure enthusiasts that their ever-expanding smartphones are too cumbersome to lug around during outdoor activities. Samsung plans to unveil the Gear Solo and its new smartphone, the oversized Galaxy Note 4, on Sept. 3 at the IFA consumer electronics show in Berlin. The Galaxy Note 4 is what is sometimes called a "phablet," sized somewhere between a phone and a tablet PC. The Galaxy Note series has been a huge success in China, and some say sales of the Galaxy S5 are slow there because many consumers are waiting for the Galaxy Note 4. A Samsung spokesman said, "China is the only country where sales of the large-screen Galaxy Note series are higher than sales of the Galaxy S series." Apple, meanwhile, is set to launch the latest iPhone. U.S. website Record on Wednesday said Apple will hold a media event on Sept. 9, where it usually unveils new products. The new iPhone will probably have 4.7-inch screen compared to the current 4 inches, keeping up with trends elsewhere in the industry. The orthodoxy at Apple used to be that the optimum size of a smartphone is 3.5 inches, which allows it to be operated with one hand. But the iPhone has been growing bigger since company founder Steve Jobs died. Some media reports forecast that Apple will roll out a smart device with a 5-inch screen at the end of this year. LG, the world's No. 6 smartphone maker, plans to unveil a large smartphone with an electronic pen and an oval smartwatch at the IFA. The stylus is aimed at enticing Chinese customers, since it is otherwise cumbersome to use a Chinese keyboard on a smartphone.